Last month I, along with a multidisciplinary team from USAID and colleagues from the Centers for Disease Control and Prevention and the National Institutes of Health, traveled to Guinea, Sierra Leone and Liberia. Our objectives were to observe Ebola recovery efforts in each country, assess the progress of USAID’s transition from response to recovery activities on the ground, and get a better understanding of the impact of the disease on the survivors. We met with government officials, international NGOs, civil society organizations, other donors, and a host of ordinary citizens from each country, and visited many project sites. One of the highlights of our time in Liberia was the visit to Lango Lippaye Elementary, Junior and Senior High School in Kakata, Margibi County, a 50-year-old school with nearly 2,200 students. 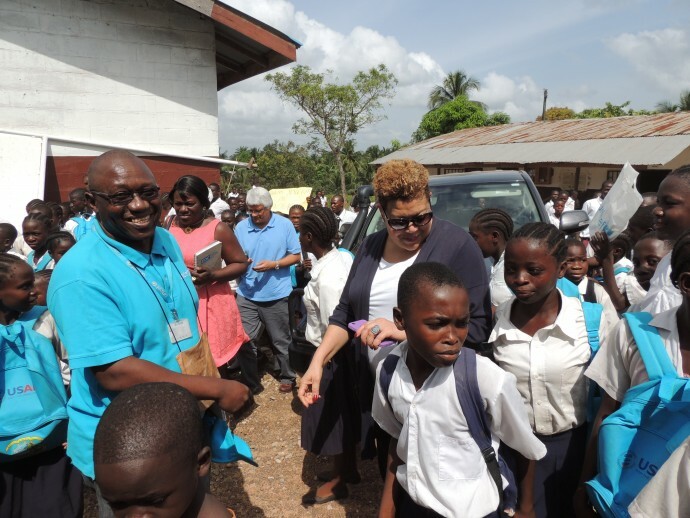 In July 2014, as the magnitude of the Ebola outbreak was gaining international attention, Liberian President Ellen Johnson Sirleaf, in an unprecedented move, closed the nation’s 4,500 schools in an effort to stop the spread of the disease. More than 1 million children were forced to stay home for over six months as the country battled the deadliest Ebola outbreak in history. Over one year later, and after 4,200 deaths, Liberia has made significant strides in defeating the disease and is focused on recovering the development gains achieved prior to the outbreak. The schools reopened in February as part of the recovery efforts. 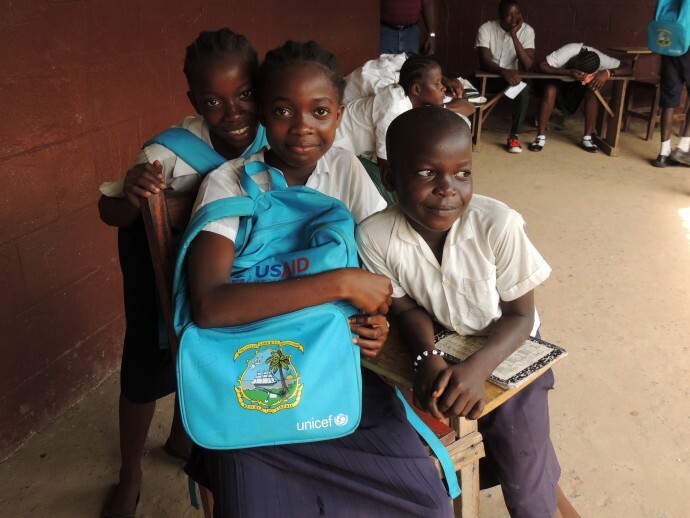 USAID and our partners at UNICEF worked with the Government of Liberia to ensure that children were able to safely return to school by providing more than 7,000 infection prevention and control kits to schools throughout the country, and training teachers and administrators on how to prevent infection. The safety kits included buckets, soap, chlorine and cleaning items to help schools reduce the risk of Ebola transmission. USAID also partnered with UNICEF to provide schools with 700,000 learning kits that included chalk, pencils, books, erasers and folders. In addition, we trained teachers and PTA members on how to provide psychosocial support to the students and their families. The students, teachers and administrators of Lango Lippaye Elementary, Junior and Senior High School welcomed us warmly during our visit. 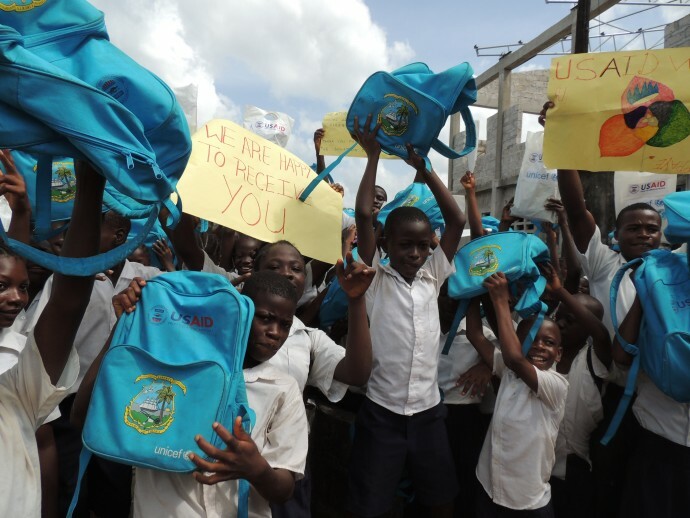 As we alighted from our vehicles, many beaming, cheering students greeted us; virtually all of them showed off their USAID-funded learning kits, holding up blue school bags with the familiar handclasp logo. 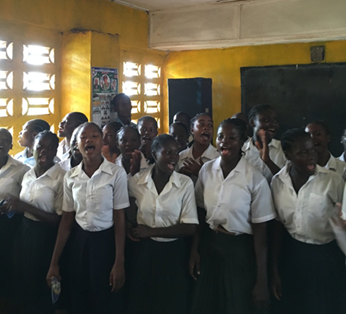 At the official welcoming ceremony, a student choir filed in singing joyously and full of energy about being grateful for the United States and its citizens for helping Liberia overcome Ebola. What an uplifting moment! The students said they were excited that they were now able to attend school and could pursue their career dreams once again. For some this meant aspiring to be doctors so they could contribute to addressing public health emergencies like Ebola. Being back in school also gave them renewed hope about the future. He noted that the school had established peer educators and a social club in an effort to fight stigma and discrimination against survivors of Ebola. Addressing survivor care and support are high priorities for USAID and we are developing new approaches to focus on this issue. We know that there is more to do. Life is still scary and difficult for many Liberians—including schoolchildren and their families. As we support future education programs, we must remain dedicated to easing their concerns about Ebola and reintegrating students who have not yet returned to school. We cannot afford to fail these students now. Their futures depend on it. Denise Rollins is the senior coordinator of the Africa Ebola Unit at USAID.